Quickly steam milk for your smooth and creamy lattes and cappuccinos with this Choice 33 oz. stainless steel frothing pitcher! When using with your cappuccino or espresso machine, partially submerge the steam wand into this pitcher filled with cold milk to create your microfoam. Then fully submerge the wand once the foam is added to finish bringing the milk up to its desired serving temperature. The created foam will be perfect for finishing off a variety of delicious and profitable hot beverages! Plus, the angled handle promotes an easy grip for complete control during use while the smooth-rimmed spout promotes accurate, precise pouring. This frothing pitcher is also great for training baristas to create latte art atop your beverages to increase their perceived value; by simply moving the pitcher in various motions while pouring the foam, you can create a multitude of designs like hearts, leaves, or flowers. The quality of this pichel is amazing! I bought it to beat the milk for coffee Very good quality! I will definitely buy in other sizes! Our employees really appreciate this addition to our warehouse kitchen. Sometimes our products require certain hot liquids to be added. This allows us to heat those liquids up and then pour directly into the different batches. Works great! This pitcher is very comfortable to hold while steaming and pouring milk. The handle does not slope down to the base like other brands, keeping your knuckles away from the hot pitcher. Great for those bigger steamed milk needs. We use it for multiple orders of hot chocolate. Gets the job done quickly and pours without messes. We love this 33 ounce frother for steaming milk for a variety of our espresso drinks. It is big enough to make 2 of our large drinks or 4 of our small drinks at once, saving us time when we get a rush of coffee orders. With the addition of a handle, we never worry about touching the hot metal. This is a great frothing pitcher, and it is an essential piece of equipment for any cafe or restaurant that has an espresso machine. We use this regularly on a daily basis and it stands up to the task. This pitcher is very well made. The material is thick and sturdy and the size is perfect for making enough frothed/steamed milk for two drinks. The handle is comfortable to hold in your hand. We actually use this frothing pitcher to hold coffee for refilling cups since it fits well under or coffee makers and it holds the perfect amount for refilling several cups. I am a returning customer of this product. Perfect size for a large coffee operation, we use it daily with no complains. It is well built and price right! This frothing pitcher is durable, easy to use, and easy to clean! It is wonderful having a larger pitcher so that we can steam milk for multiple drinks at once. We like this pitcher a lot. It look simple, but made well with good thickness and the stainless steel remained shiny after many washes. will order more as needed. Sturdy construction and good quality. Size works well for making up to four cappuccinos. 3 stars because of pouring which drips. The lip is fairly straight and would benefit from a slight curve on the lip to avoid those dribbles. This is our favorite pitcher. It works great for foaming or steaming. Very solid which cuts down on the sound while steaming easy pour spout cuts down on spills. 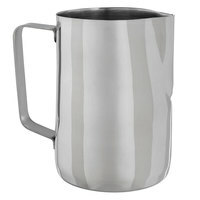 This 32 oz Frothing Pitcher is perfect for heating and frothing milk for our lattes. We can do two at a time due to the 32 oz capacity. We love it! Best frothing pitcher ever! we have bought some before and when you heat up the milk the handle would heat up too. That does not happen here! its so very easy to handle and to pour even when the milk is boiling hot! Buying more soon! The 33 oz pitcher will hold enough milk for me to make a 12oz and a 16oz drink, barely. Anything more would overflow. Its the perfect size for our purposes. We use it in a coffee trailer. I have two of these, and two of the 20oz pitchers. I have yet to use the 20oz, because the 33oz serves my needs perfectly. This pitcher is really nice for steaming larger drinks and has help up well. The only reason I took off one star is because it seems like no matter how much we clean it or polish it - it always looks like it has water spots or soap scum on it. I'm not sure if its a natural patina overtime or the polish has just worn off but after only 2 months of daily use its looking very sad. No breaks or issues with it other than it's visual issues. These pitchers are the normal steaming pitcher that every shop has. They work great and last forever. I wish the pouring spout was a tad more tapered, but not a deal breaker. This frothing pitcher is a great size. The stainless steel is good quality and the spout is perfect for making beautiful latte art. Great buy! Perfect size, perfect weight, perfect pour! These are very durable and a great size for steaming our medium and large size lattes. Easy to clean and hold on to, also was an amazing price compared to other coffee retailers. Great pitcher for steaming milk. Very easy to handle and use with any steam wand. The pitcher cleans up nicely and looks great on the shelf. Great tool for making our lattes and cappuccinos and steaming milk for hot chocolate. They take a daily beating and still look almost new. We keep a few on hand and glad we do. We use steaming pitchers every day. These pitchers are holding up to very high heat and cleaning every day. I would recommend these as a coffee shop must have. We opened a shop in July, and have used these since the beginning. They've held up very well, no dings but just some slight discoloration. Can get the nice microfoam that I'm looking for, and the spout allows for some decent latte art. I prefer to use a slightly smaller one for 12oz drinks, but as long as your careful a 12oz can be accomplished in this one no problem. Would order again. These work well but we find that they're too large for proper steaming. If you need a 32 oz pitcher, I suggest getting one with a conical shape (smaller at the bottom large at the opening) because they're better suited for creating perfect microfilm and pouring. I really like this pitcher. Its just the size I was looking for. The price was good and I ordered multiple of them for my shop. We love this pitcher! This is the perfect size because we can make two medium drinks with it at once. Perfect for a nice latte! Perfect size pitchers for our espresso bar! They hold heat well, and clean up beautifully too! Great price for a great product! We love these! If you are frothing milk for 16 oz coffee, 33 oz pitcher is a way to go. This is a high quality product, which I will be purchasing more in the future. Nice and thick frothing cup for our espresso machine. This is the larger size that can easily steam enough milk for 2+ drinks. Best price online! Great for steaming and frothing milk for cappuccinos, frappes and just plain milk. Cup is easy to clean and big enough not to tip over and doesn't get to heated! Sturdy frothing pitcher great for making a couple lattes at the same time and holds plenty of steamed milk. For the price you can't go wrong. this 33 oz .frothing cup is very sturdy ,i love it so much and use it everyday. its strong and shine . you can use it to make tea or coffee .i will buy it again .thanks web. This pitcher is great for steaming milk for a busy coffee shop. It is small enough to use for cappuccino's or you can steam enough milk for about 2 lattes in it. The frothing cups are sturdy so that they don't tip very easily. They look sleek and clean to the customers. They also clean up very easily. Very nice. Most of you will realize that this is an unusually low price for these items and I can tell you that the quality shouldn't be a concern to you. If you like using these larger frothing pitchers, as I always have, this is an excellent source. Pros: Great for steaming 24oz hot cocoas, ciders, and small/medium milk for espresso beverages...nice and shinny. Cons: They don't pour well, meaning for latte art and the fact it dribbles down the side of the pitcher onto the counter. this is a great product to have especially for a coffee shop! very sturdy for making froths and steaming milks! cant complain. we love it! This pitcher is great for steaming milk for a cappuccino or latte. The pointed spout makes it useful for practicing latte art. The stainless steel pitcher looks professional and has a nice weight to it. This item was actually alot bigger than I thought. But we definitely been able to get much use of it for the larger drinks and more. Again, they were about 25% cheaper than my usual vendor (soon becoming my "old vendor") and arrived within a few days of ordering. This site has become my go-to source. Great Frothing pitcher. Big enough for 2 large latte's and hold the temperature real well. Not too big or too small. It has a great handle and very easy to clean. A frothing cup should be easy to get and there should not be much difference, well there is... And after 3 different frothing pitchers we have found one that has a comfortable handle that the new employees do not burn themselves with due to the angle of the handle and also the weight. I definitely recommend.